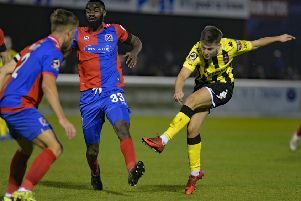 AFC Fylde’s Ryan Croasdale captained England C in their 1-0 win over Estonia Under-23s at Leyton Orient’s Breyer Group Stadium on Wednesday night. The midfielder played the full 90 minutes in east London as did his Coasters team-mate James Hardy, who went close with a first-half shot. Blackpool-born Kurt Willoughby, the FC United of Manchester striker who came through the ranks at Foxhall Juniors and AFC Blackpool, came off the bench for the final 15 minutes. Alfie Pavey of Havant and Waterlooville scored the only goal from the penalty spot in the second half. AFC Fylde’s Mill Farm stages international football on Thursday evening, when Paul Simpson’s England Under-20s face Italy at 7pm. Admission is £3 for adults and £1 for children and supporters are urged to purchase in advance via the club’s website or ticket office. AFC Blackpool are also in action this evening at Bacup Borough in the Hallmark Security League first division (7.45pm). Victory would lift Dave Worthington’s side five places to fifth in the table.